For the American musician, see Mississippi John Hurt. Sir John Vincent Hurt, CBE (born 22 January 1940) is an English actor and voice actor whose career has spanned six decades. He initially came to prominence for his supporting role as Richard Rich in the film A Man for All Seasons (1966). Since then he has played leading roles as Quentin Crisp in the film The Naked Civil Servant (1975), John Merrick in David Lynch's biopic The Elephant Man (1980), Winston Smith in the dystopian drama Nineteen Eighty-Four (1984), Mr. Braddock in the Stephen Frears drama The Hit (1984), and Stephen Ward in the drama depicting the Profumo affair, Scandal (1989). He is also known for his television roles such as Caligula in I, Claudius (1976), and the War Doctor in Doctor Who. Hurt's other films include the prison drama Midnight Express (1978), the science-fiction horror film Alien (1979), the adventure film Rob Roy (1995), the political thriller V for Vendetta (2006), the sci-fi adventure film Indiana Jones and the Kingdom of the Crystal Skull (2008), the Harry Potter film series (2001–11), the Hellboy films (2004 and 2008), and the Cold War espionage film Tinker Tailor Soldier Spy (2011). His character's final scene in Alien has been named by a number of publications as one of the most memorable in cinematic history. Recognisable for his distinctive rich voice, he has also enjoyed a successful voice acting career in films such as Watership Down (1978), the animated The Lord of the Rings (1978), The Black Cauldron (1985) and Dogville (2003), as well as the BBC television series Merlin. Among other honours, he has received two Academy Award nominations, a Golden Globe Award, and four BAFTA Awards, with the fourth being a Lifetime Achievement recognition for his outstanding contribution to British cinema. Hurt was born in Chesterfield, Derbyshire, the son of Phyllis (née Massey; 1907-1975), an amateur actress and engineer, and Arnould Herbert Hurt (1904-1999), a mathematician who became a Church of England clergyman and served as vicar of Shirebrook. Hurt's father was also Vicar of St John's parish, Sunderland. In 1937, he moved his family to Derbyshire, where he became Perpetual Curate of Holy Trinity Church. When Hurt was five, his father became the vicar of St. Stephen's Church in Woodville, south Derbyshire, and remained there until 1952. Hurt had a strict upbringing; the family lived opposite a cinema, but he was not allowed to see films there. He was also not permitted to mix with local children because his parents saw them as "too common". At the age of eight, Hurt has sent to the Anglican St Michael's Preparatory School in Otford, Kent, where he eventually developed his passion for acting. He decided he wanted to become an actor, and his first role was that of a girl in a school production of The Bluebird (L'Oiseau Bleu) by Maurice Maeterlinck. He has stated that while he was a pupil at the school, he was abused by Donald Cormack (now deceased), then Senior Master of the school and later Headmaster until his retirement in 1981. Hurt has said that Cormack would remove his two false front teeth and put his tongue in the boys' mouths, and how he would rub their faces with his stubble, and that the experience affected him hugely. Hurt's father moved to Old Clee Church in Grimsby, Lincolnshire, and Hurt (then aged 12) became a boarder at Lincoln School (then a grammar school) in Lincoln, because he had failed the entrance examination for admission to his brother's school. Hurt often went with his mother to Cleethorpes Repertory Theatre, but his parents disliked his acting ambitions and encouraged him to become an art teacher instead. His headmaster, Mr Franklin, laughed when Hurt told him he wanted to be an actor, telling him that he "wouldn't stand a chance in the profession". Aged 17, Hurt enrolled in Grimsby Art School (now the East Coast School of Art & Design), where he studied art. In 1959, he won a scholarship allowing him to study for an Art Teacher's Diploma (ATD) at Saint Martin's School of Art in London. Despite the scholarship, paying his tuition fees and living expenses was difficult, so he persuaded some of his friends to pose naked and sold the portraits. In 1960, he won a scholarship to RADA, where he trained for two years. He was then cast in small roles on television. Hurt's first film was The Wild and the Willing (1962), but his first major role was as Richard Rich in A Man for All Seasons (1966). In 1971, he played Timothy Evans, who was hanged for murders committed by his landlord John Christie, in 10 Rillington Place, earning him his first BAFTA nomination for Best Supporting Actor. His portrayal of Quentin Crisp in the TV play The Naked Civil Servant (1975) gave him prominence and earned him the British Academy Television Award for Best Actor. The following year, Hurt won further acclaim for his bravura performance as the Roman emperor Caligula in the BBC drama serial, I, Claudius. In the 2002 TV documentary I Claudius: A Television Epic, Hurt revealed that he had originally declined the role when it was first offered to him, but that series director Herbert Wise had invited him to a special pre-production party, hoping Hurt would change his mind, and that he was so impressed by meeting the rest of the cast and crew that he reversed his decision and took the role. In 1978, Hurt appeared in Midnight Express, for which he won a Golden Globe and a BAFTA and was nominated for an Academy Award for Best Supporting Actor (the latter of which he lost to Christopher Walken for his performance in The Deer Hunter). Hurt voiced Hazel, the heroic rabbit leader of his warren in the film adaptation of Watership Down and later played the major villain, General Woundwort, in the animated television series version. His other roles in the 1970s and the beginning of the 1980s included Kane, the first victim of the title creature in the film Alien (1979, a role which he reprised as a parody in Spaceballs); would-be art school radical Scrawdyke in Little Malcolm (1974); and John Merrick in The Elephant Man (1980), for which he won another BAFTA and was nominated for a Golden Globe and an Academy Award for Best Actor. In 1978, he lent his voice to Ralph Bakshi's animated film adaptation of Lord of the Rings, playing the role of Aragorn. He also had a starring role in Sam Peckinpah's critically panned but moderately successful final film, The Osterman Weekend (1983). Also in 1983, he starred as the Fool opposite Laurence Olivier's King in King Lear. Hurt also appeared as Raskolnikov in the 1979 BBC TV miniseries adaptation of Crime and Punishment. Hurt played Winston Smith in the film adaptation of the novel Nineteen Eighty-Four (1984). In 1985, he starred in Disney's The Black Cauldron, voicing the film's main antagonist, the Horned King. In 1986, Hurt provided the voiceover for AIDS: Iceberg / Tombstone, a public information film warning of the dangers of AIDS. In 1988, he played the title role, the on-screen narrator, in Jim Henson's The StoryTeller TV series. He had a supporting role as "Bird" O'Donnell in Jim Sheridan's film The Field (1990), which garnered him another BAFTA nomination. In 1997, Hurt played the reclusive tycoon S.R. Hadden in Contact. In 2001, he played Mr Ollivander, the wand-maker, in the first Harry Potter film, Harry Potter and the Philosopher's Stone. He returned for the adaptation of Harry Potter and the Goblet of Fire, though his scenes in that film were cut. He also returned for Harry Potter and the Deathly Hallows – Part 1 and Part 2. In 1999, Hurt provided narration on the British musical group Art of Noise's concept album The Seduction of Claude Debussy. During this time, he narrated a four-part TV series The Universe which was released on DVD in 1999. In the film V for Vendetta (2006), he played the role of Adam Sutler, leader of the Norsefire fascist dictatorship. In May 2008, he appeared in Steven Spielberg's Indiana Jones and the Kingdom of the Crystal Skull as Harold Oxley. He is also the voice of The Great Dragon Kilgharrah, who aids the young warlock Merlin as he protects the future king Arthur, in the BBC television series Merlin. In 2008, 33 years after The Naked Civil Servant, Hurt reprised the role of Quentin Crisp in An Englishman in New York. This film depicts Crisp's later years in New York. In June 2009, Hurt played the on-screen Big Brother for Paper Zoo Theatre Company's production of Orwell's Nineteen Eighty-Four. The theatre production premiered at the National Media Museum, in Bradford and toured during 2010. Hurt said, "I think Paper Zoo thought it would be quite ironic to have the person who played Winston having risen in the party. From the Chestnut Tree Cafe, he's managed to get his wits together again, now understanding that 2 and 2 make 5, and becomes Big Brother. So it tickled my fancy, and of course I looked up Paper Zoo, and they seem to me to be the sort of company that's essential in the country as we know it, and doing a lot of really good stuff." At the 65th British Academy Film Awards Hurt won the award for Outstanding British Contribution to Cinema. In 2013, Hurt appeared in Doctor Who as a 'forgotten' incarnation of the Doctor, known as the War Doctor. His character first appears at the conclusion of the series seven finale "The Name of the Doctor"; his origins are given in the mini-episode "The Night of the Doctor"; he regenerates in the 50th anniversary episode "The Day of the Doctor",  He reprised the role on audio for Big Finish Productions in a series of sets starting from December 2015. Hurt is due to appear alongside Ben Kingsley in a film entitled Broken Dream, to be directed by Neil Jordan. In 2015, Hurt provided the voice of the main antagonist Sailor John in the Thomas & Friends film Sodor's Legend of the Lost Treasure along with Eddie Redmayne and Jamie Campbell Bower. Hurt has an older brother, Br. Anselm (born Michael), a Roman Catholic convert who became a monk and writer at Glenstal Abbey; Hurt has contributed to his brother's books. Hurt also has an adopted sister, Monica. In 1962, Hurt's father left his parish in Cleethorpes to become headmaster of St. Michael's College in the Central American country of British Honduras. Hurt's mother died in 1975, and his father died in 1999 at the age of 95. In 1962, Hurt married actress Annette Robertson. The marriage ended in 1964. In 1967, he began his longest relationship, with French model Marie-Lise Volpeliere-Pierrot, sister of fashion photographer Jean-Claude Volpeliere-Pierrot. The couple had planned to get married after 15 years together, when events took a tragic turn on 26 January 1983; Hurt and Volpeliere-Pierrot went horse riding early in the morning near their house in Ascott-under-Wychwood, Oxfordshire. Volpeliere-Pierrot was thrown off her horse and injured. She went into a coma and died later that day. In September 1984, Hurt married his old friend, American actress Donna Peacock, at a local Register Office. The couple moved to Kenya but divorced in January 1990. On 24 January 1990, Hurt married American production assistant Joan Dalton, whom he had met while filming Scandal. With her, he had two sons: Alexander "Sasha" John Vincent Hurt (born 6 February 1990) and Nicholas "Nick" Hurt (born 5 February 1993), who are currently residing in County Waterford, Ireland. This marriage ended in 1996 and was followed with a seven-year relationship with Dublin-born presenter and writer Sarah Owens. The couple moved to County Wicklow, where they settled close to their friends, director John Boorman and Claddagh Records founder and Guinness heir Garech Browne. In July 2002, the couple separated. In March 2005, Hurt married his fourth wife, advertising film producer Anwen Rees-Meyers. He now lives near Cromer, Norfolk. In 2007, Hurt took part in the BBC genealogical television series Who Do You Think You Are?, which investigated part of his family history. Prior to participating in the programme, Hurt had harboured a love of Ireland and was enamoured of a 'deeply beguiling' family legend that suggested his great-grandmother had been the illegitimate daughter of Irish nobleman the Marquess of Sligo. The genealogical evidence uncovered seemed to contradict the family legend, rendering the 'suggestion' doubtful. Coincidentally the search revealed that his great-grandmother had previously lived in Grimsby at a location within a mile of the art college at which Hurt had been a student. On 16 June 2015, Hurt publicly announced that he had been diagnosed with early-stage pancreatic cancer. He confirmed that he would continue to work while undergoing treatment and said that both he and his medical team were "more than optimistic about a satisfactory outcome". Following treatment, Hurt stated that his cancer was in remission on 12 October 2015. In 2004, Hurt was made a Commander of the Order of the British Empire (CBE). He was knighted in the 2015 New Year Honours for services to drama. On 17 July 2015, he attended an investiture ceremony at Windsor Castle where he received the accolade from Queen Elizabeth II. In 2012, Hurt was among the British cultural icons selected by artist Sir Peter Blake to appear in a new version of his most famous artwork – the Beatles' Sgt. Pepper's Lonely Hearts Club Band album cover – to celebrate the British cultural figures of his life that he most admires. In 2014, Hurt received the Will Award, presented by the Shakespeare Theatre Company, along with Stacey Keach and Dame Diana Rigg. Opened in September 2016, The John Hurt Centre is an education and exhibition space located at Cinema City, Norwich. Since 2003, Hurt has been a patron of the Proteus Syndrome Foundation, both in the United Kingdom and in the US. Proteus syndrome is the condition that Joseph Merrick, whom Hurt played (renamed as John Merrick) in The Elephant Man, is thought to have suffered from, although Merrick's exact condition is still not known with certainty. Since 2006, Hurt has been a patron of Project Harar, a UK-based charity working in Ethiopia for children with facial disfigurements. Hurt was announced as patron of Norwich Cinema City in March 2013. In January 2002, Hurt received an honorary degree from the University of Derby. In January 2006 he received an honorary degree of Doctor of Letters from the University of Hull. In 2012 he was appointed the first Chancellor of Norwich University of the Arts. On 23 January 2013 he was made an Honorary Doctor of Arts by the University of Lincoln, at Lincoln Cathedral. 1987 Spaceballs Kane Cameo of his Alien (1979) character 'Kane', humorously self-parodied with the line: "Oh no... Not again!" 2013 Charlie Countryman Narrator Voice. Hurt's narration was in the original version of the film shown at the Sundance Festival, but subsequently the film was re-edited and the narration removed (though it is available as an 'extra' on the Blu-ray release). 1961 Drama 61–67 Private Briggs Episode 1.16: "Drama '61: Local Incident"
1964 Thursday Theatre Orpheus Episode 1.11: "Point of Departure"
1976 Play for Today Alec Cassell Episode 6.22: "The Peddler"
1976 Sweeney, TheThe Sweeney Tony Grey Episode 3.4: "Tomorrow Man"
2007 Masters of Science Fiction Samswope Episode 1.4: "The Discarded"
2008–2012 Merlin The Great Dragon, Kilgharrah Voice; does not appear in every episode, yet is credited in the opening title sequence for each episode. Also provides the narrative voice at the start of the title sequence. 2013 Doctor Who The War Doctor Episodes "The Name of the Doctor", "The Night of the Doctor", and "The Day of the Doctor"
2014 The Strain Professor Abraham Setrakian Unaired pilot episode only; replaced by David Bradley in series. When Love Speaks (2002, EMI Classics) – "Sonnet 145"
Hurt is seen as the 'Brian Epstein' esque mogul in Paul McCartney's 1982 video for his song "Take It Away". McCartney explains in the video commentary section of The McCartney Years DVD (for the song 'Take it Away') that Hurt himself was a friend of the Beatles and Brian Epstein, and that the Beatles had watched Hurt act in the mid-'60s and thought him a fine actor. Hurt is the narrator of the 1995 Discovery Channel documentary On Jupiter. Narrator on the album The Seduction of Claude Debussy by the band Art of Noise (1999). Hurt is the narrator of the 4 part series The Universe for Channel 4 International, released in 1999 and available on DVD. Hurt co-starred alongside Kiefer Sutherland in the 10 part web series The Confession. A line from the movie Nineteen Eighty-Four, featuring the voice of Hurt can be heard as the introduction to the Manic Street Preachers song "Faster"
In two volumes of a documentary called Life in the Animal Kingdom: Untamed Africa, filmed in the Maasai Mara Game Preserve in Kenya (the two volumes being called Hunter and Hunted and Survival on the Serengeti), Hurt served as the narrator. Benjamin Britten – Peace and Conflict, a British feature film written and directed by Tony Britten - narrator. Narrator for the BBC 5 live documentary "The day we won Wimbledon." Narrator of the Mercedes F1 Team video ad based on the poem "If-" by Rudyard Kipling. Hurt voiced an unseen character in the short The Alchemist's Letter by Carlos Andre Stevens. Following Hurt's role of The War Doctor in Doctor Who, he voiced the character in four audio sets from Big Finish Productions beginning in December 2015. The second set was released in February 2016, the third in September 2016 and the fourth in February 2017. 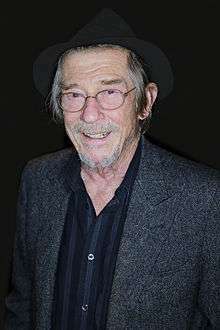 ↑ "John Hurt Biography: Film Actor, Theater Actor, Television Actor (1940–)". Biography.com (FYI / A&E Networks). Retrieved 16 June 2015. ↑ Jones, Paul. "Doctor Who 50th anniversary: John Hurt to play "part of the Doctor"". Radio Times. Retrieved 18 May 2013. ↑ Tobin, Christian. "John Hurt teases 'Doctor Who' 50th anniversary special role". Digital Spy. Retrieved 18 May 2013. BBC News (26 April 2007). "Alien named as top 18-rated scene". British Broadcasting Corporation. Retrieved 31 May 2010. Kermode, Mark (19 October 2003). "All fright on the night". The Guardian. UK. Retrieved 1 February 2010. "Scariest movie scenes ever". Virgin Media. Retrieved 18 January 2010. Green, Graeme. "John Hurt talks Harry Potter, flamenco and chestbursters". Metro. Retrieved 18 January 2010. "The 100 Scariest Movie Moments". Bravo. Archived from the original on 30 October 2007. Retrieved 29 May 2010. "The making of Alien's chestburster scene". The Guardian. UK. 13 October 2009. Retrieved 18 January 2010. ↑ "John Hurt – Biography". Talk Talk. Retrieved 26 January 2010. ↑ "John Hurt 'thrilled' with Bafta lifetime achievement honour". bbc.co.uk. BBC News. Retrieved 13 April 2015. ↑ "John Hurt Biography (1940–)". Filmreference.com. Retrieved 28 October 2010. ↑ "BBC Radio Derby". Retrieved 28 October 2010. 1 2 "The Guardian Interview: John Hurt". The Guardian. UK. 1 July 2000. Retrieved 28 October 2010. ↑ "History of St Michael's School". Stmichaels.kent.sch.uk. Retrieved 28 October 2010. ↑ Sholto Byrnes (16 October 2005). "John Hurt: I was abused, too". Independent on Sunday. London. Retrieved 28 October 2010. ↑ Rob Sharp (19 April 2008). Central Saint Martins: The art and soul of Britain Archived 20 April 2016 at the Wayback Machine.. The Independent (London). Retrieved July 2013. ↑ "BFI Screenonline: AIDS: Iceberg / Tombstone". Screenonline.org.uk. Retrieved 26 May 2013. ↑ "IESB First Look: Indy IV Looks Back at the Original Trilogy" (Video). IESB. 1 May 2008. Retrieved 1 May 2008. ↑ "Actor Hurt to reprise Crisp role". BBC News. 29 April 2008. Retrieved 6 May 2010. ↑ "John Hurt on 1984". National Media Museum. Retrieved 28 October 2010. ↑ Rayner, Gordon (3 July 2013). "Doctor Who's new adversary - the Prince of Wales". The Daily Telegraph. London. Retrieved 4 July 2013. ↑ "Doctor Who: The War Doctor - News - Big Finish". ↑ "Ben Kinglsey & John Hurt for Neil Jordan – John Boorman's 'Broken Dream'". IFTN. Retrieved 15 April 2011. ↑ "Br. Alselm's cookbook". Glenstal.org. 17 October 2009. Retrieved 28 October 2010. ↑ Norman, Michael (2 December 1990). "John Hurt: Always in Character". The New York Times. Retrieved 15 April 2013. ↑ Scanlon, Gisele "Bondings", Independent.ie, 21 April 2002. Retrieved 18 September 2012. ↑ "Acting legend John Hurt talks about his upcoming BAFTA award and life living near Cromer". Johnhurt.co.uk. Retrieved 26 May 2013. ↑ "Who Do You Think You Are? – John Hurt". BBC Magazine. Retrieved 9 August 2014. 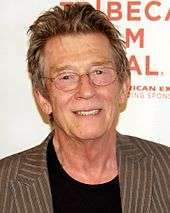 ↑ "Actor John Hurt reveals cancer diagnosis: agency". Reuters. 16 June 2015. Archived from the original on 16 June 2015. Retrieved 16 June 2015. ↑ "'John Hurt 'more than optimistic' as he reveals pancreatic cancer diagnosis'". The Guardian. 15 June 2015. Retrieved 15 June 2015. ↑ "'John Hurt "overjoyed" and "thrilled" at cancer remission news'". DigitalSpy. 14 October 2015. Retrieved 14 October 2015. ↑ "Actor Hurt earns his CBE". BBC News. 9 December 2004. Retrieved 26 May 2013. ↑ The London Gazette: (Supplement) no. 61092. p. N2. 31 December 2014. ↑ 2015 New Year Honours List Archived 2 January 2015 at the Wayback Machine. ↑ "'Proud' John Hurt Receives Knighthood". Sky News. 17 July 2015. Retrieved 17 July 2015. ↑ "New faces on Sgt Pepper album cover for artist Peter Blake's 80th birthday". The Guardian. 5 October 2016. ↑ "The John Hurt Centre". Norfolk at the Pictures. Retrieved 26 September 2016. ↑ "Proteus Syndrome Foundation UK". proteus-syndrome.org.uk. ↑ Tibbles JA, Cohen MM (1986). "The Proteus syndrome: the Elephant Man diagnosed". Br Med J (Clin Res Ed). 293 (6548): 683–5. doi:10.1136/bmj.293.6548.683. PMC 1341524 . PMID 3092979. ↑ Spiring P (Jun 2001). "The improbable "Elephant Man"". Biologist (London). p. 104. Retrieved 1 January 2015. ↑ "Ancient DNA analysis unveils mystery of history's most horribly deformed man -- The Elephant Man". EurekAlert!. 21 July 2003. Retrieved 1 January 2015. ↑ Highfield, Roger (22 July 2003). "Science uncovers handsome side of the Elephant Man". The Daily Telegraph. London. Retrieved 1 January 2015. ↑ "John Hurt". Project Harar. 19 July 2006. Retrieved 28 October 2010. ↑ Sabah Meddings (29 March 2013). "John Hurt announced as new patron of Norwich's Cinema City". EDP24. Retrieved 1 January 2015. ↑ "Hollywood glamour marks the official renaming of Norwich University of the Arts". Nua.ac.uk. Retrieved 1 February 2013. ↑ "Hollywood legend takes up Norwich University post". ITV News. 29 June 2012. Retrieved 26 May 2013. ↑ "John Hurt CBE joins honoraries at January graduation" Archived 22 March 2014 at the Wayback Machine., University of Lincoln, 21 January 2013. Retrieved 21 March 2013. ↑ Bilge Ebiri (15 November 2013). "Ebiri on Charlie Countryman: A Death Haunted Shia LaBeouf Goes East". Vulture. Retrieved 23 September 2014. ↑ Justin Lowe (22 January 2013). "Charlie Countryman". The Hollywood Reporter. Retrieved 23 September 2014. ↑ Kevin Yeoman (29 January 2014). "Charlie Countryman Blu-ray Review". High Def Digest. Retrieved 23 September 2014. ↑ "The Gruffalo's Child". BBC One. Retrieved 10 December 2011. ↑ ""On Jupiter" on the Discovery Channel". jpl.nasa.gov. Retrieved 14 August 2013. ↑ Wilford, John (3 December 1995). "COVER STORY; Jupiter Is a Nice Place to Visit . . . But You Wouldn't Want to Live There – Page 2". The New York Times. Retrieved 14 August 2013. ↑ "BBC Radio 5 live - The Day We Won Wimbledon". BBC. ↑ IF... 20 November 2014. ↑ IF... 21 April 2015. Wikimedia Commons has media related to John Hurt.